Point of entry at Port Mua-i-Walu, Suva. Local ship operators must submit their vessel schedules at least 48 hours prior to their expected time of arrival and departure at Suva ports. 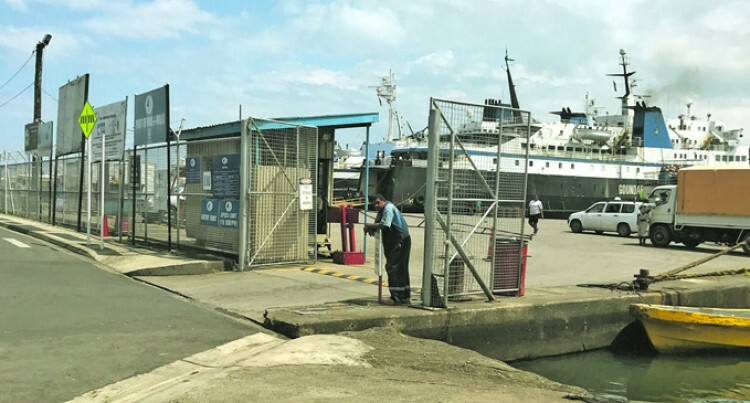 Apart from assisting Fiji Ports Corporation Limited (FPCL) in making necessary arrangements with relevant stakeholders it would also eliminate congestion at port of entry. FPCL chief executive officer Vajira Piyasena said the solution implemented by the company was to eliminate congestion. “Before arriving and leaving, ship operators are required to submit their schedules 48 hours earlier,” Mr Piyasena said. “Only those (passengers) holding tickets are allowed on to the jetty as well as those sending or receiving cargoes. “They must produce their tickets at the gates. Others are to remain at the waiting shed. He urges members of the public and ship operators to adhere to the wharf access control measures. “This is a concerted effort with the Ministry of Transport, Suva City Council, Fiji Roads Authority and Fiji Police to control traffic in the Mua-i-Walu surrounding areas,” he said. “Certain strategies are being executed immediately in compliance to FPCL’s recent implement control measures. “Earlier this year, there was a re-routing of traffic at Tofua Street through Matua Street to ensure free flowing of traffic at all times. FPCL ports include Kings wharf and Mua-i-walu in Suva; as well as the ports of Malau in Vanua Levu; Lautoka, Vuda, Levuka, Wairiki and Rotuma.